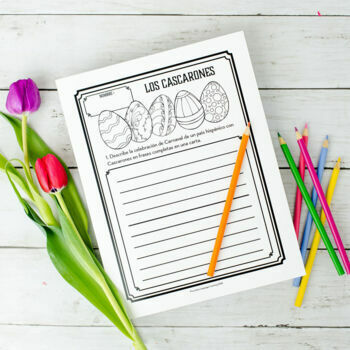 Help beat Spring fever in your Spanish classroom with a Spanish Easter activity that's bursting with color, confetti, and high-frequency structures! 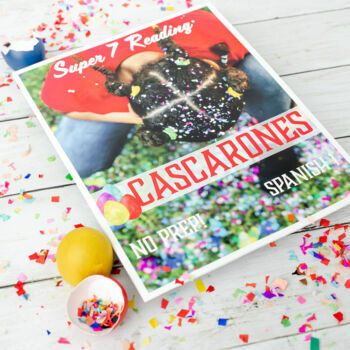 This Spanish springtime cultural reading with super seven verbs focuses on los cascarones, the Hispanic tradition of Easter confetti eggs. It also includes targeted Spanish Easter vocabulary. 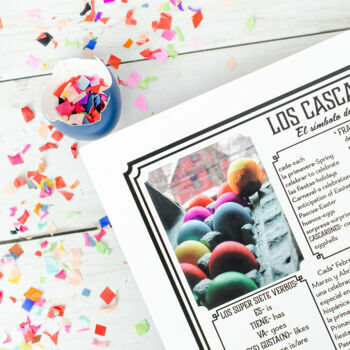 Your Spanish class will love this Pascua cultural reading in comprehensible input about los cascarones with bright photos that truly show the products, practices, and perspectives of the fun cascarón tradition. This Spanish reading is written in simple, targeted, repetitive, high-frequency, and comprehensible input with Mike Peto's Super Seven verbs as the focus. The best part is the bright, engaging photos-your students will feel transported right into the fiesta! This reading and activity set is NO-PREP, completely written in comprehensible Spanish for level 1-2 classes, with 4 suggested follow-up activities. Reading is 2 pages & includes an English glossary . You can read more about how I use comprehensible input in my high school world language classes at my blog-become a subscriber for exclusive content! Follow my TpT store by clicking the green star above to be the first to find out about sales & events!